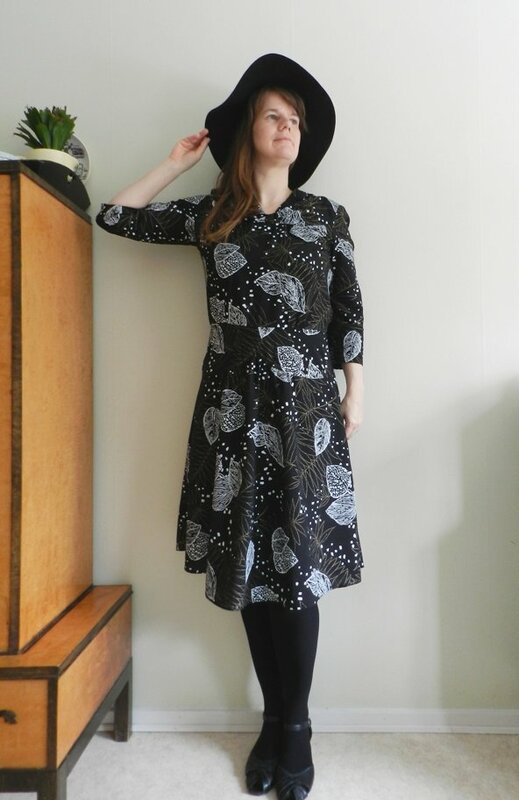 Over the past few years I have grown very fond of 40s-style dresses and I have managed to accumulate quite a few vintage and reproduction patterns, as well as suitable vintage fabrics. 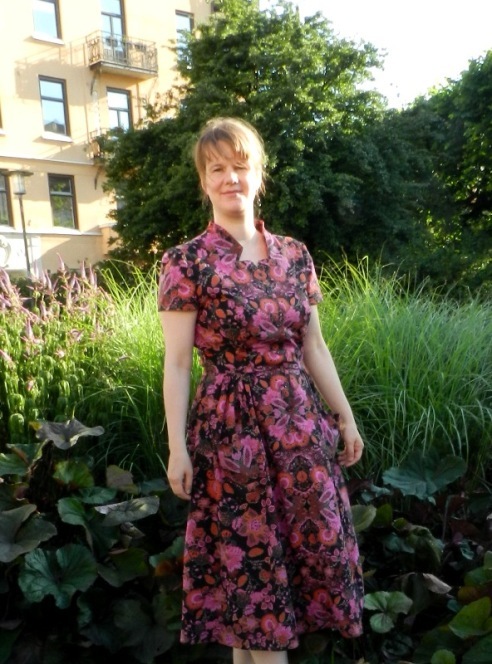 Although two dresses I completed last year (Butterick 6282 and Butterick 6363) haven’t made it to the blog yet, I still have much more material than I can justify. 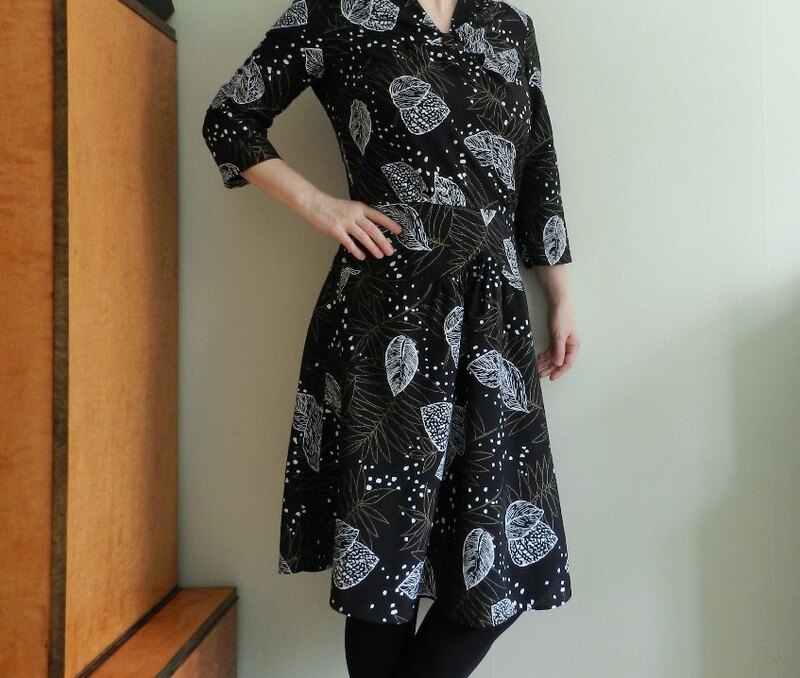 In an attempt to make better use of what I have, I dug up Simplicity 1587 from my stash. Not sure if my eyes are betraying me, but I couldn’t find the pattern on Simplicity’s website, so here’s a link to Pattern Review. The advantage of using a pattern that now appears to be out of print is that plenty of reviews can be found on the internet. 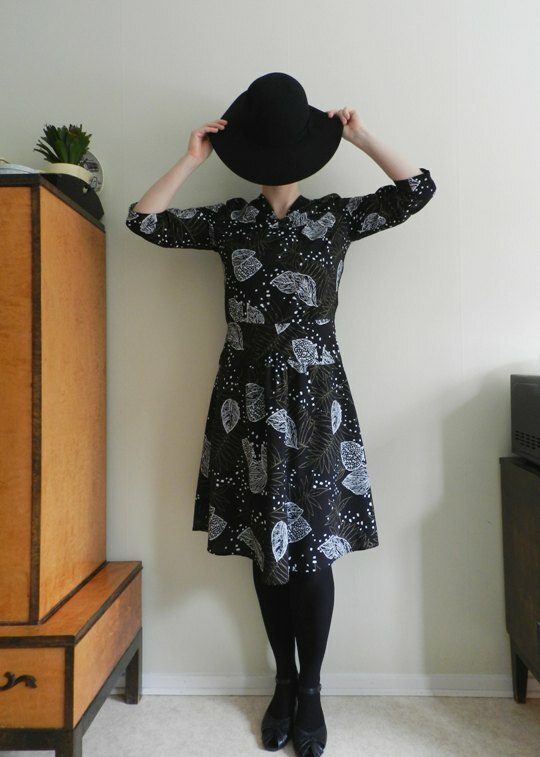 Looking at photographs of finished dresses I was not sure whether the style would suit me. Instead of making a proper muslin, I used some cheap fabric, which bought at the thrift store for this specific purpose. 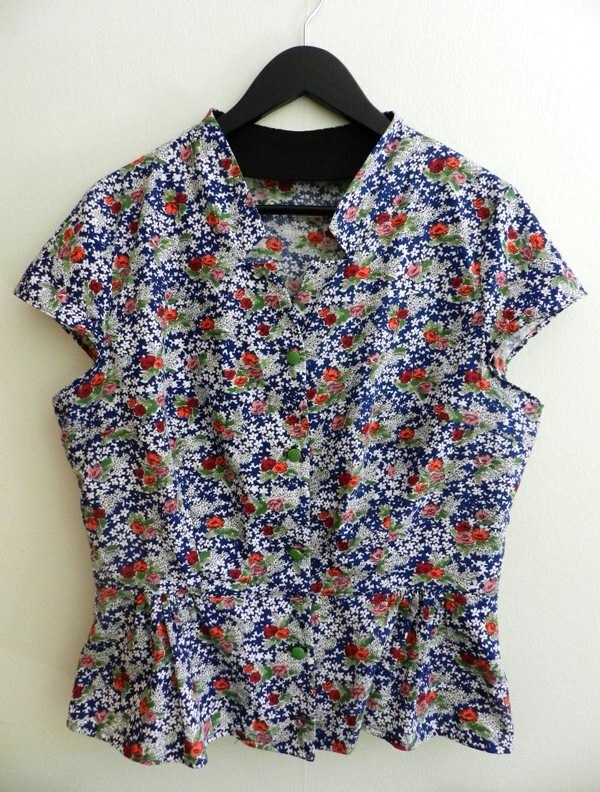 This modern rayon with a white and gold leaf print seemed appropriate for a 40s dress. 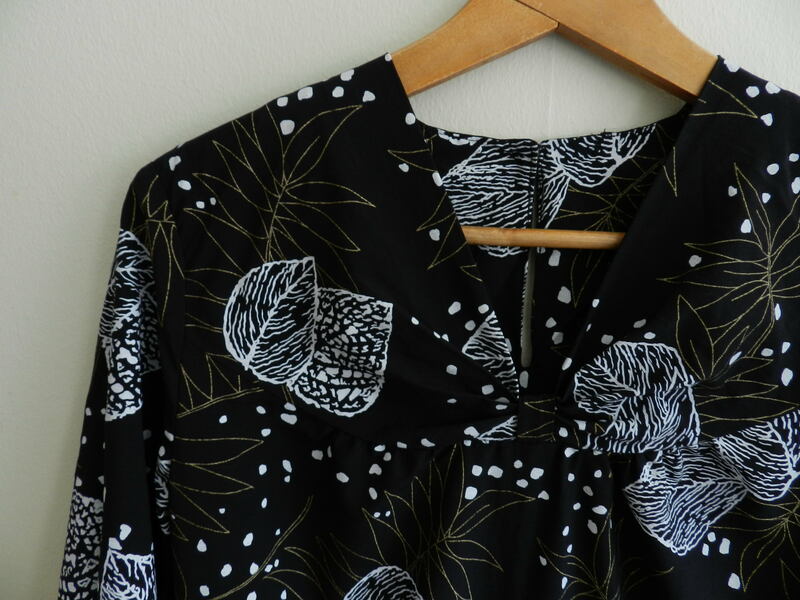 My main issue with the fabric is the way the white leaves are printed. The white dye is rather thick and lies on top of the fabric much like the print on a T-shirt and the parts with the dye are stiffer and more difficult to gather. I shouldn’t complain too much about the fabric though, as it was easy to cut, sew and press. 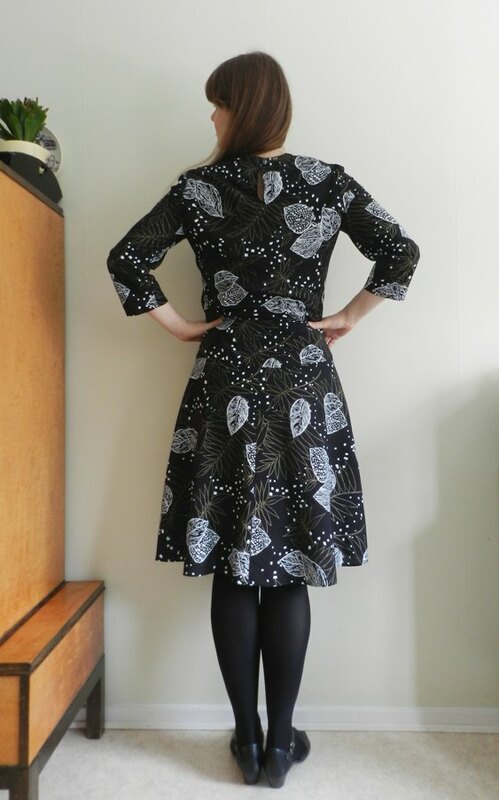 I obviously did not pay much attention to the pattern placement and ended up with two leaves on my behind. This dress came together surprisingly fast, although it certainly helped that I wasn’t going for the most perfect finish. The only thing I did by hand was sewing on the button in the back of the neck. Oh, and I also made a little thread loop for the button, as I wanted to practise my thread loop making skills. The instructions were easy to follow, except for failing to explain where to start when folding the tucks in the bodice yoke. Fortunately, Kelly from Seamracer has clarified this matter. Thanks Kelly! As usual when sewing a pattern from one of the big American companies I picked a size 16. As this dress is quite loose-fitting across the bust, I forewent a Full Bust Adjustment. Instead, I added about 6cm to the bodice pieces and adjusted the length once the bodice was ready to be attached to the skirt. I messed up this part and accidentaly shortened the front instead of the back. 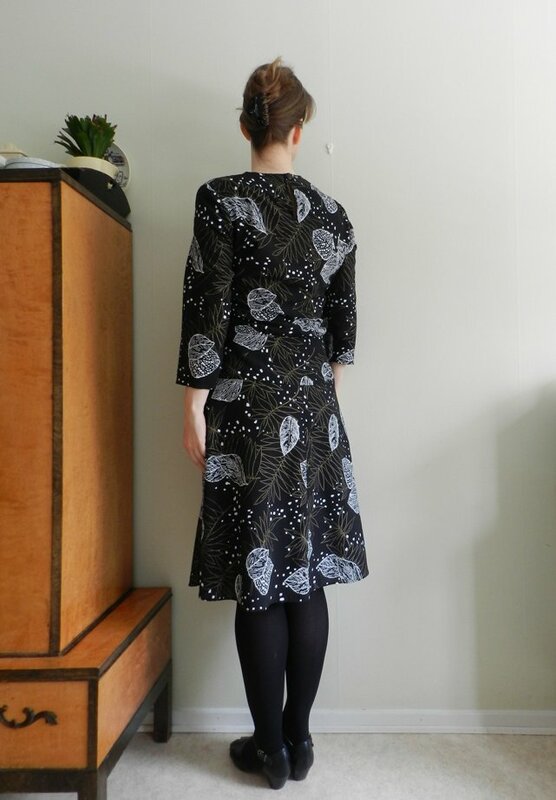 Fortunately, it is not that obvious, but for futere incarnations of this dress I should remember to add 3cm to the back, 4cm to the side seams 4cm and 5cm to the front 5cm. The hem and waistlines are not perfectly level and there is also some excess fabric in the bodice’s back. Next time I will also widen the lower front bodice somewhat, so the gathers across the bust will be more pronounced. I lenghtened the skirt with 3cm and am satisfied with where it hits. As I had enough fabric, I cut out the three-quarter sleeves, which are more practical in this climate than those ending above the elbow. 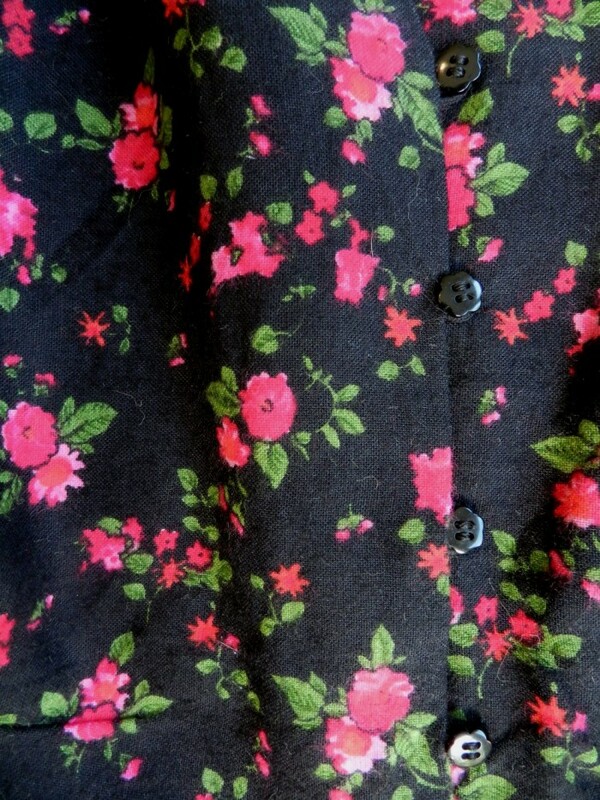 That having said, I do like the look of the shorter sleeves and they would have worked well in this fabric. I left off the bow for the time being. 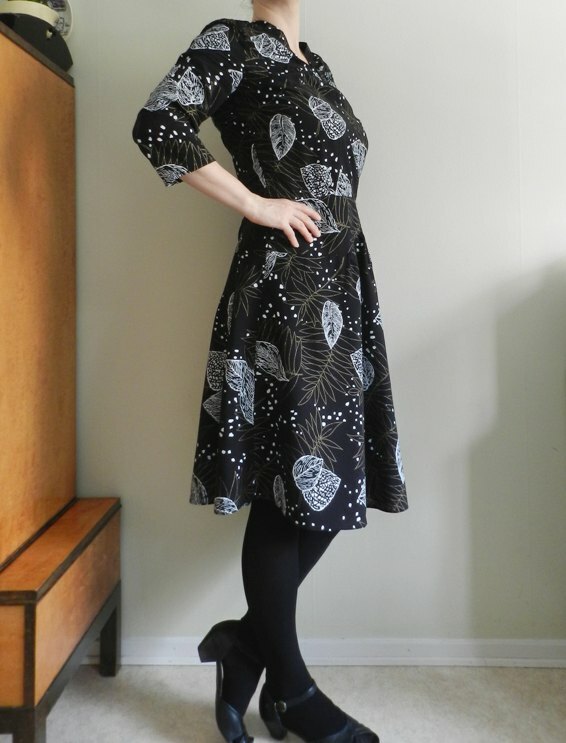 This dress turned out better than I had hoped, especially considering that it did not cost that much time and effort. Even the somewhat cheap-looking fabric kept surprising me; initially, the hemline was quite wavy, with the hem turning up on itself. A wash and some ironing greatly improved this issue. The pattern is a winner in my opinion, although I agree with Dixie DIY that the dress needs more gathers across the bust for them to look intentional rather than sloppy. While trying on the dress during assembly the sleeves and yoke felt restrictive, but once finished I found the dress to be quite comfortable. Initially, I considered sizing up for my next version, but I don’t think that will be necessary, especially since I plan on using fabric with a little more give. I do wish that the V-shaped neckline was a bit lower, so I might add some length to the yoke as well next time. 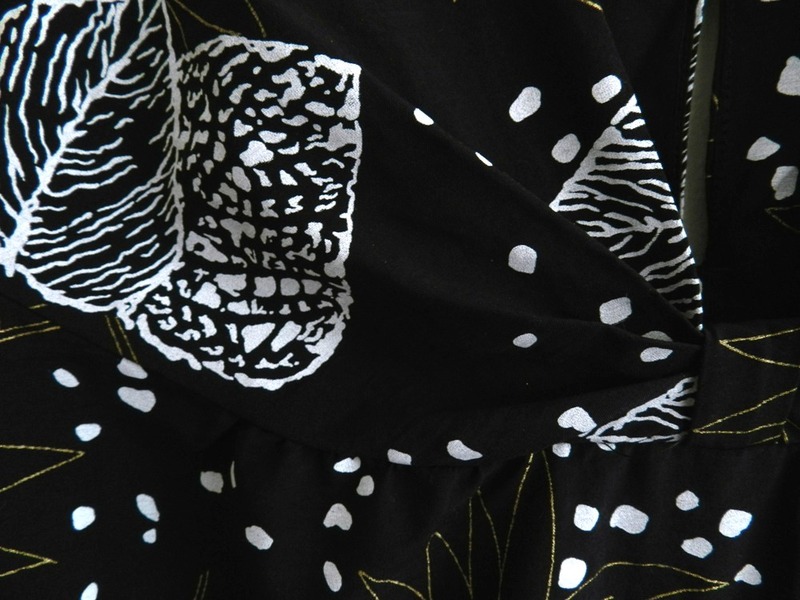 Like many others, I chose a patterned fabric and thus ended up obscuring the dress’ design lines. 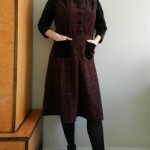 I love how Mode de Lis’ solid maroon version brings out the pleated yoke, one of the dress’ most attractive features. Therefore, my next version will probably be in a plain fabric, most likely a lightweight black wool or a burnt orange wool crepe. Both are obviously winter fabrics, so I do not feel compelled to get started right away, especially not because spring just arrived to Malmö! This was a very cheap project even including the pattern, which cost me about EUR 7. The 2m of woven viscose/rayon were thrifted (in the Netherlands) for about EUR 1. The 40cm long YKK zipper was bought some time ago at Stoff & Stil, where it currently costs SEK 12.95 (c. EUR 1.30). The simple black button and the embroidery thread to make the button loop came from my stash.